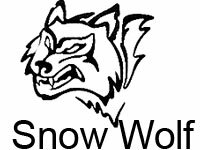 The Snow Wolf M24 is an upgraded sniper rifle modeled after the M24 Sniper rifle used by US Army snipers. 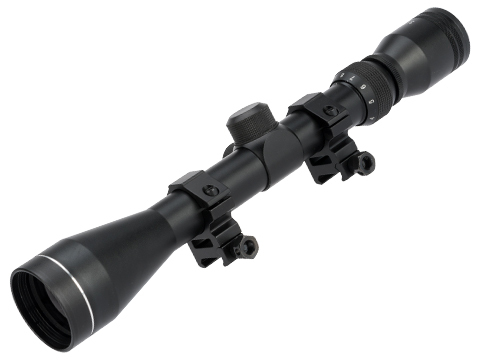 Shooting between 450~550 FPS right out of the box it boasts an impressive range. 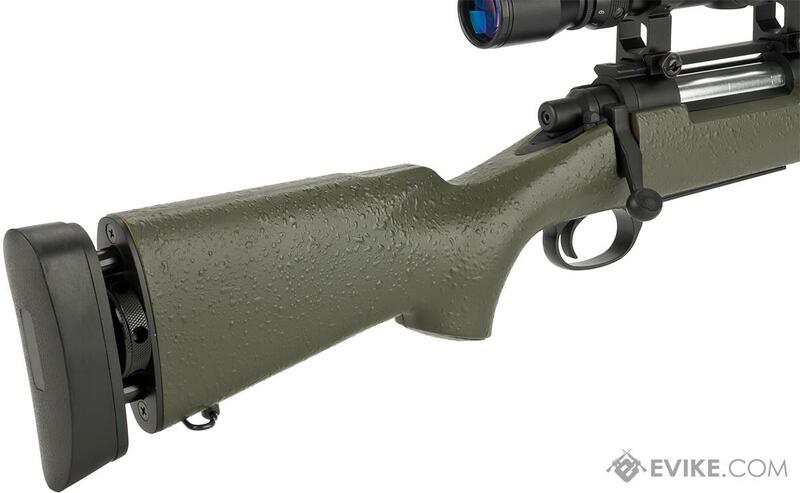 This rifle also comes with an integrated scope rail and bipod mount. 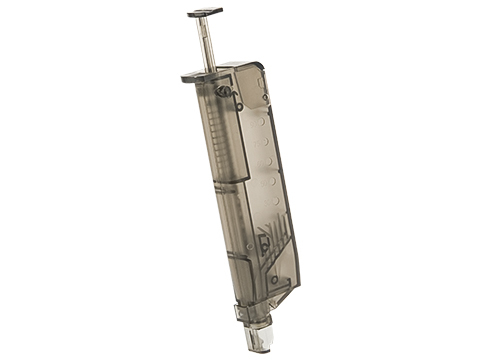 The high density polymer frame combined with a metal bolt, trigger box, and outer barrel ensures it's durability under heavy use. 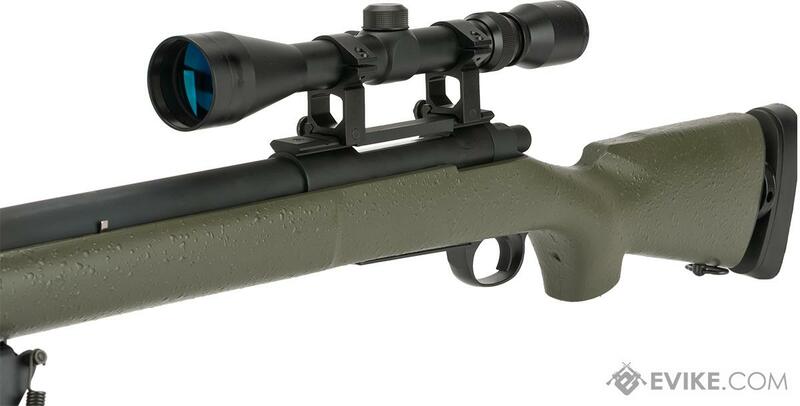 The M24 is a versatile, accurate, and powerful rifle platform that compliments any sniper loadout. Upgrade FAQ: *Internal system: Maruzen APS / Type96 system. Takes all Angel Custom / Laylax APS upgrade parts. Find Spare Magazines here at Evike.com! So went to town on it have added a mega scope, put a put a mock power up suppressor on it . Has a real mean look and performs well. Chronoed it getting a consistent 490fps. Good sold gun and evike have them on offer makes a good platform for upgrading. 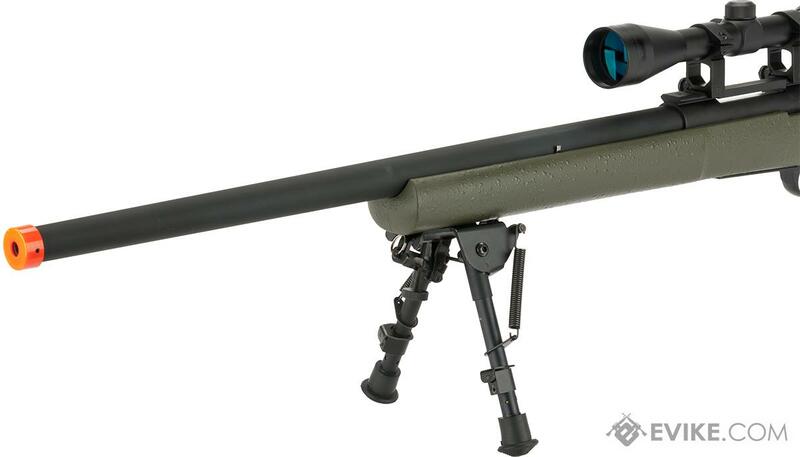 "I recommend this sniper, but there are some things to consider. When I was putting it together out of the box, I of course didn't follow the instructions and threw it together. I put the LONGER screw into the SHORTER screws hole and when I tightened it, I mashed the screw into the cylinder itself. I then had to fix that before it would work. Totally my fault but I add this to my review with hopes of saving non instruction readers like myself some disappointment and sadness. After that tragic event was fixed, this &#34;Wolf&#34; shot 419fps out the box. I found .33 bbs get me the best results. They are slower but more on point. I bought this with the intent on upgrading it with the Angel Customs tune up kit. For $120 I can't complain too much. 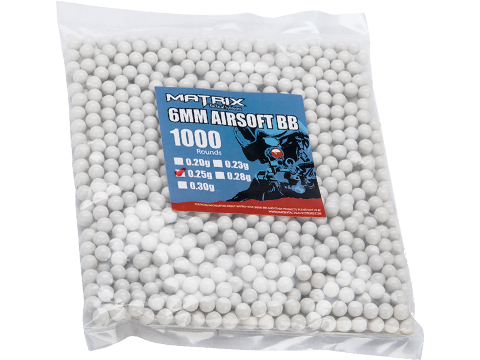 Again, I DO RECOMMEND THIS AIRSOFT GUN! "M24 arrived quickly (free 3 day coupon) in a package that had been crushed and a bag of pellets busted open. 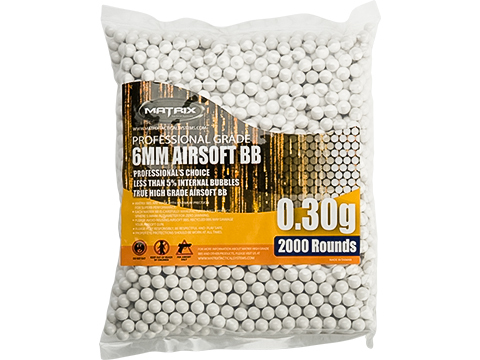 Pellets replaced graciously by Evike. Otherwise all well. M24 is solidly built, metal &#34;gun&#34; parts like the real thing, except magazine and various other hard plastic parts, as well as the furniture. The stock grip is way larger than the real thing, I mean, like hand and a half status, and not very comfortable. Operates like the real thing, bolt action. 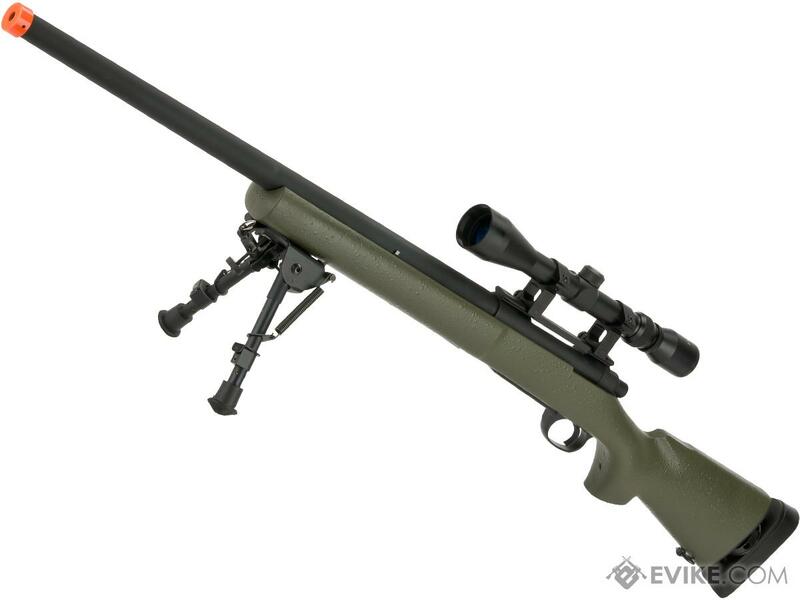 Bolt sticks and stiff, but acceptable since not a real precision bolt action sniper rifle. The &#34;magazine&#34; is not in the original spot like the real thing, fortunately, you may upgrade the dummy mag with other aftermarket options. The instruction manual didn't match up too well, but illustrated how to assemble the M24. 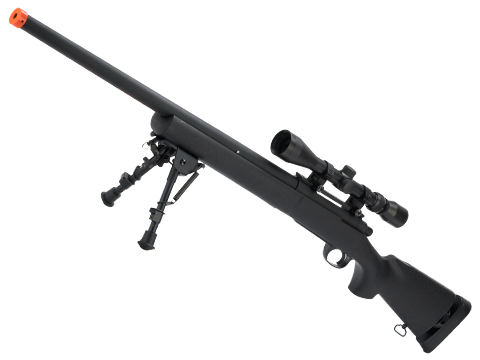 M24 shoots well enough, 100' or more adjustable with hop up, and dependent on pellet weigh. Hit accuracy is questionable consistency. 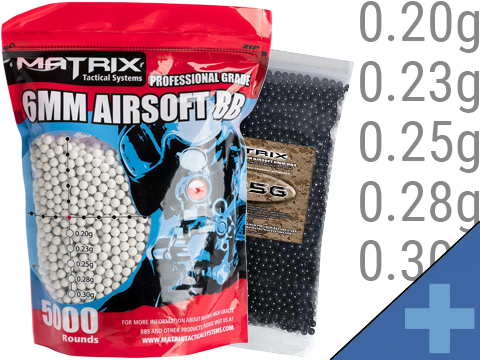 Range is fine for airsoft, very very very very short for any &#34;real&#34; sniping, don't get your hopes up (want REAL, get a hold of the real thing). Includes threaded &#34;barrel&#34; option for accessories like a suppresor. Unfortunately the external &#34;barrel&#34; comes damaged due to &#34;Orange tip&#34; pins (2) installation, pins are removable with needle nose pliers (just pull). You'll need to do this to install the included threaded &#34;barrel&#34;. After installation, I opted for an FMA TB993, nothing fancy, but works and looks good. The fittings need tightening or they loosen when fired excessively (suggest LocTite on threaded barrel and fitting, not on actual accessory, so as to allow for removability). 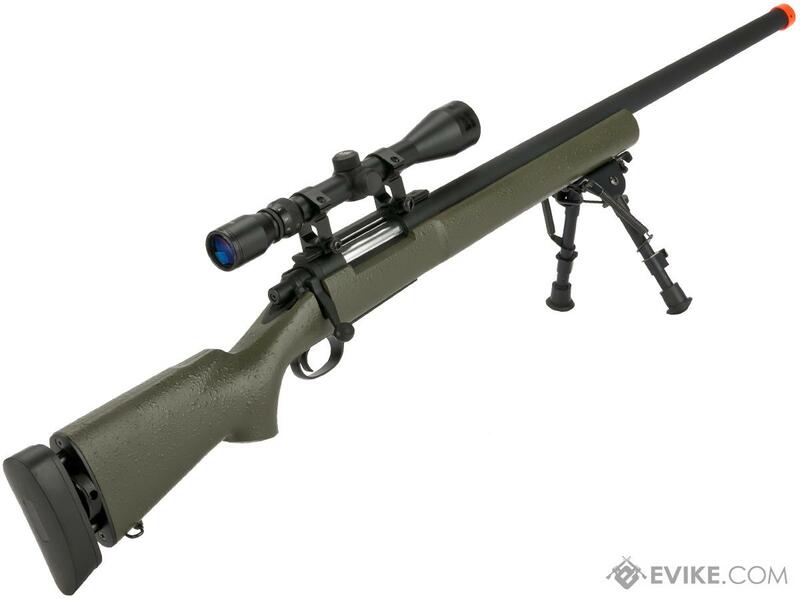 Discuss about Snow Wolf US Army M24 Military Airsoft Bolt Action Scout Sniper Rifle (Color: OD Green) with your friends and fellow Evike.com shoppers!